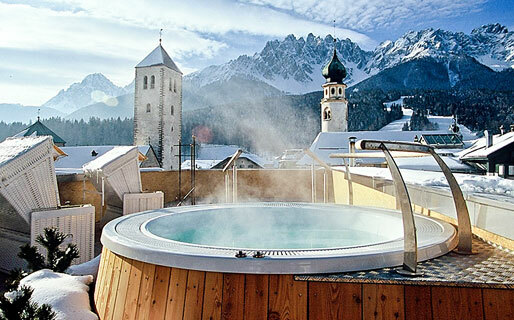 Dominating the main square of San Candido, Cavellino Bianco dates all the way back to the late 19th century, when the Kühebacher transformed buildings belonging to the family farm into a splendid Belle Epoque hotel. More than a century later, the hotel stills conserves the same combination of typical Tyrolean charm and Fin de Siècle elegance which so impressed its first guests. Open the door of your room at Hotel Cavallino Bianco and walk in to your very own romantic home in the mountains - complete with personal cinema program! Whether you choose to relax on the panoramic Pyramid terrace overlooking the bell-towers of San Candido, soaking in the hydromassage pool or sunbathing in the solarium; or decide to spend your time in the spa with heated indoor pool, saunas, tropical showers, massage rooms and hay-flower baths - it's only too easy to feel and look wonderful at Hotel Cavallino Bianco! Mountain munches and... the movies! How to spend the evening at Cavallino Bianco? First stop, the restaurant: for decades considered to be one of the best in the whole of Val Pusteria. And when you've finished your feast of traditional Tyrolean treats? Stay at San Candido's Cavallino Bianco and you get to go to the movies... without having to leave the hotel! The cinema is not the only indoor entertainment available: there's a billiard room, bowling pitch and, for the younger members of the family, a play area with giant blocks of Lego, a climbing wall, mega-slide, table football and even play-stations!